Update: Israeli Prime Minister and Health Minister Benjamin Netanyahu commented on Tuesday about the governmental plan to establish a national digital health database, saying that the government will protect the privacy of patients with “Iron pinchers.” Mr. Netanyahu spoke at a conference held by the Ministry of Health in Tel Aviv. Also speaking at the conference, Director General of the Ministry of Health Moshe Bar Siman Tov said that the ministry is aware of the concerns that digitizing patients’ medical information could compromise their privacy. “We are committed to ensure the highest level of protection,” Mr. Bar Siman Tov said. On Sunday, the Israeli Government approved a national plan to promote digital health in the country, with a five year budget of $264 million (NIS 922 million). Some of the money would go to support collaboration between the Israeli healthcare system and local startups operating in the domain of digital health. According to the plan, the startups will develop technological solutions including disease prediction and treatment recommendations based on access to the databases of Israel's four health maintenance organizations. All Israeli citizens are required by law to be members of one of these organizations, which function as both service providers and health insurers. The program mandates the establishment of a specialized medical database called Psifas (mosaic), which will include information provided voluntarily by patients with conditions that current medical practices cannot address fully. Such conditions will include orphan diseases, cancer and heart conditions, autoimmune conditions such as Crohn's disease or colitis, and mental disorders such as post-traumatic stress disorder and depression. While the medical data will be provided to relevant startups either free of charge or at a small fee, the government estimates that the infrastructure created by the program could eventually net Israel around $3.5 billion a year, according to a statement by the Israeli Ministry for Social Equality. The Ministry’s announcement did not specify the exact sources of this new boost to the Israeli economy, nor a time frame for these expected revenues. Israel is currently home to between 400 and 500 digital health startups, and the new program could create 1,500 more, Eli Gruner, director-general at the Israeli Prime Minister Office said in a Sunday interview with Calcalist. "There's no reason Israel shouldn't be at the head of the pack," Mr. Gruner said. 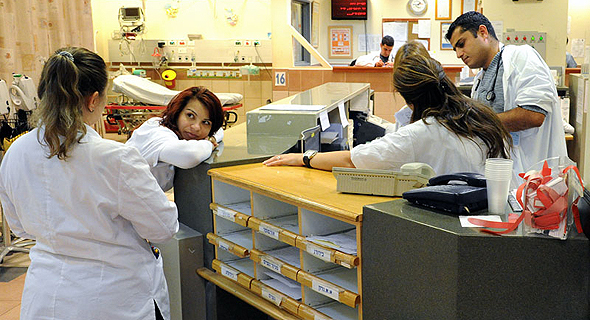 As of 2004, as part of the computerized National Health Records project, all electronic health records in Israel are shared among community providers, including primary care physicians, specialists, laboratories, and pharmacies. This digitization costs weigh down Israeli health maintenance organizations, already operating at a deficit. The monetary infusion planned as part of the new initiative can help Israeli health organizations allocate more of their budget to actual patient care, Israeli health executives say. "We perform our research activities without an earmarked budget, and without support," said in a Sunday interview Ran Balicer, the founder and director of the research institute of Clalit Health Services, the largest health maintenance organization in Israel. While insights generated by commercial companies using the data may be beneficial to patients, there is no certainty that resulting insights will make their way back to local patients and doctors. The plan gives rise to difficult privacy and information security issues, amidst a global backlash concerning new revelations with regard to the way U.K.-based consulting firm Cambridge Analytics sold data pertaining to 50 million Facebook users to the presidential campaign of U.S. President Donald Trump. Israel has already set up a citizen biometric database, the establishment of which has come under severe criticism from both Israeli information security researchers and human rights and privacy advocacy groups. The Israeli government document outlining the new initiative specifies security mechanisms to be applied, including a demand for patient consent and the anonymization of data. While the government says the patient data will be anonymized, there is no true way to de-identify such extremely specific data even if the patient name itself is omitted, Israeli lawyer Jonathan Klinger said in a Monday interview with Calcalist. Mr. Kilnger helmed efforts to overturn the decision to create the country’s governmental biometric database and the legal battles to delete it after it was set up. “The correct way to set up such a program is to offer patients who choose to opt in a discounted service plan,” Mr. Klinger said. Mr. Balicer said the strictest security measures will be applied to ensure the safety of the data collected as part of the new database. Lilach Baumer contributed to the article.